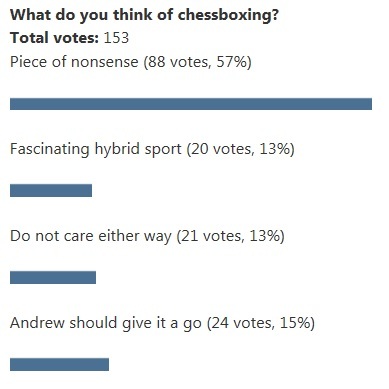 The “What do you think about chessboxing?” poll ended sooner than planned due to server issues, but it lasted long enough to give a clear verdict. ‘Piece of nonsense’ won by a knockout. A reminder of the ‘Who will win the 2017 US Championship?’ poll result, as Wesley So will face Alexander Onischuk in a play-off for the title this evening. 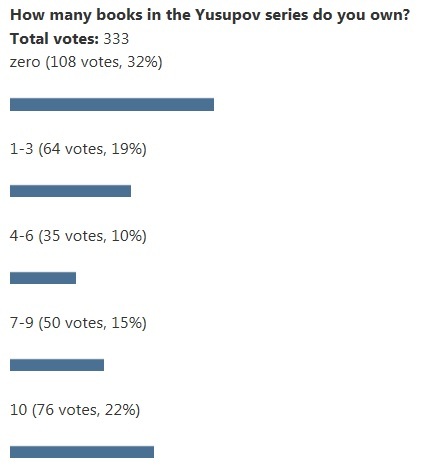 Wesley So is still the favourite, but it was fine work by the one person who voted for “other”. Normally I steer well clear of anything political, but there is at least a chance that recent FIDE manoeuvres could affect world chess. Today Kirsan Ilyumzhinov is still nominally FIDE President but the real power seems to belong to his deputy Mr Makropoulos. Maybe a less controversial leader than Kirsan could lead to bigger sponsorship opportunities for top-level chess? So it’s a good change, bad change or no real change at all? One of the minor irritations of being a chess fan is that when chess is mentioned in the mainstream media, it is usually because a chess player did something odd, not something brilliant. Recent mainstream chess stories include a player losing on purpose to protest pairings, and Kirsan resigning/not resigning, though at least that is less toxic than some of Kirsan’s previous headlines. Over the weekend, chessboxing made some headlines in the UK as a UKIP Member of the European Parliament (no political comments thanks!) Jonathan Arnott made a highly unsuccessful debut. There is a Quality Chess connection, as Andrew was at the bout as a spectator, and Mr Arnott is in the same 4ncl squad as Colin (though usually in the second team, while Colin is of course in the first team). The basic idea of chessboxing is that two players/fighters play chess for a while, then box for a while, then back to the chess game, and so on. Checkmate or knockout ends the contest. You can see a video of the boxing part of the Arnott bout here, though it might be best avoided if you like proper boxing. The chess part was not pretty either, but from Arnott’s opponent. One undoubted plus of the chessboxing event was that Mr Arnott was raising money for a Spinal Muscular Atrophy charity (link to donation site). So full credit to Mr Arnott for that. So what do you think about chessboxing? Fascinating hybrid sport? Piece of nonsense for two people who are no good at either sport? 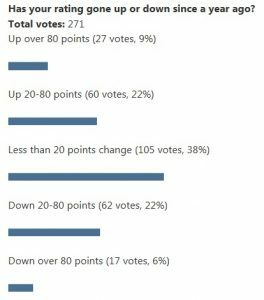 Last week’s poll asked ‘Has your rating gone up or down since a year ago?’ The ‘almost unchanged’ answer was unsurprisingly most common, but when you add up the other answers you see 87 gained significantly, while 79 went down significantly. 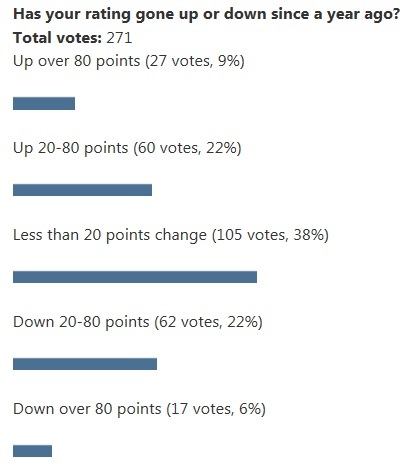 And the big gainers (up over 80 points) are an impressive 10% of the vote (I know it says 9% below, but that’s because the poll software decided to round 9.963% down to 9%). So not bad at all, especially as I suspect that many blog readers here are not young kids who might expect their ratings to increase naturally. But compare the real results on rating changes with a poll question from the start of 2016: ‘Do you think your rating will go up or down in 2016?’ The optimists vastly outnumbered the pessimists. Next week the US Championship starts in its now traditional location in St Louis. With 3 of the top 6 players in the world competing – So, Caruana and Nakamura – I find the US Championship the most interesting national championship in the world. The strength in depth is also there, with Kamsky, Robson, Shankland, Onischuk and Xiong in the 12-player event. If So has a ridiculously brilliant tournament he could challenge Carlsen’s World Number 1 position, as the gap is 16 Elo points. But my question is: Who will win the 2017 US Championship? 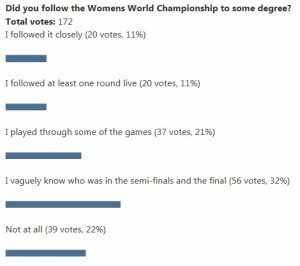 Last week’s poll question was ‘Did you follow the Women’s World Championship to some degree?’ There was a decent range of responses, but I think it fair to say the event did not have huge numbers of avid spectators. If you take the votes for ‘didn’t follow it at all’ and ‘I vaguely know who was in the semifinals and the final’ then you are already over 50% of the vote. For this week’s poll we will check how your chess results have been going: Has your rating gone up or down since a year ago? Many, perhaps most, of our books have ‘improving your chess’ as part of their point, so if you are reading this blog then there seems a decent chance you are interested in improving your chess results. So let’s see how you have been doing over the past year. Did you follow the Women’s World Championship? 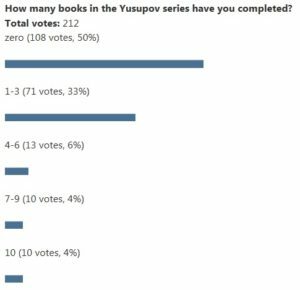 Last week’s poll question was “How many books in the Yusupov series have you completed?” The result is clear: ‘zero’ was top followed by ‘1-3’ with the rest lagging a long way behind. Sure, a number of those who voted ‘zero’ will not own any of the books, but there are certainly many who have bought the books but not gotten around to working through them yet. So the Yusupov Challenge is much needed. 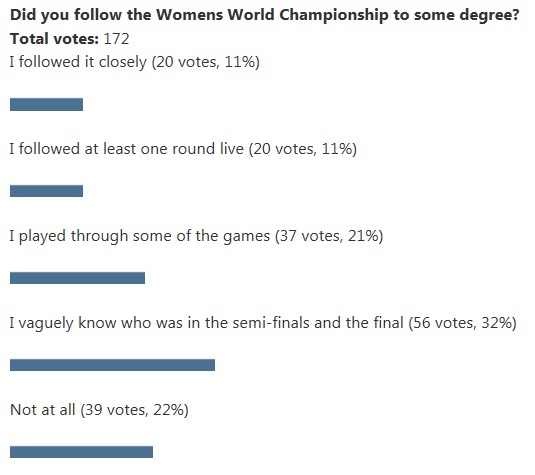 This week’s poll question is: “Did you follow the Women’s World Championship to some degree?” This is a follow-up question to last month’s “Will you be following the Women’s World Championship live?” when the main answer was ‘no’. But maybe a few of the dramatic incidents caught your attention and encouraged you to follow the action? Or maybe you prefer to check out the games after they are finished, rather than follow it live. There are so many ways to follow a chess event these days, it is almost impossible to make a good guess about the size of the audience. How many books in the Yusupov series have you read? Last week’s poll question was “How many books in the Yusupov series do you own?” Top answer was ‘zero’ but next was ’10’. 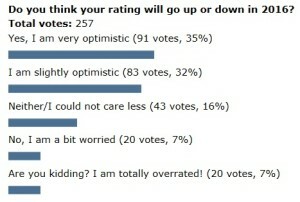 I find that hugely encouraging. My interpretation is that if you read one Yusupov book, you may be impressed enough to want to get all of them. Obviously giving a simple numerical answer does not tell the whole story, as some of you own none, some own them all. So saying you have read “zero” means very different things for different people. But I am still interested enough in the raw numbers, especially in how many have read them all. And we hope that this number will increase due to the Yusupov Challenge. Last week’s poll question was: ‘Where are you?’ I offered so many options that an image big enough to make all the results readable would break the internet, so below are just the edited highlights. ‘Rest of Europe’ was our big winner, which reminds me of an old joke that claims a British newspaper once published a headline: “Fog in English Channel – Continent isolated”. Anyway, we at Quality Chess are very much pro-European, but since we don’t deal with politics on this chess blog, please don’t interpret that as a comment about Brexit. We also have good numbers here from North America, India and Asia in general. Everyone is welcome, even those from the neglected Caribbean. In a recent blog post we saw the views of GM Adhiban Baskaran on the Yusupov series. There were nine books in the original series, and then Revision & Exam 1 with more to come we hope. So for this week the poll question is: How many books in the Yusupov series do you own?